It's not really a road trip until you have a car, is it? 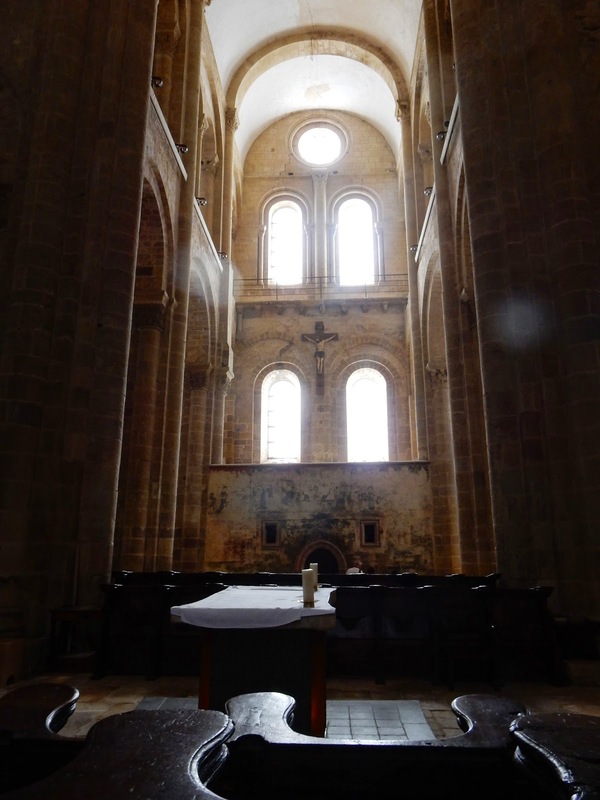 On Sunday, we headed to the Lyon Gare Part-Dieu to pick up our rental vehicle, a Volvo 40. It is quite roomy and a recent model. He has never driven a Volvo, so Bob had to figure out how to adjust the seats, how to start the car (with a push button) and how to find all six gears on the stick shift before we headed off - in the wrong direction! This inauspicious start was one of many delays and frustrations we experienced on our first day on the road: 1) it took an hour to line up, register and be given our car; 2) our GPS took a long time to function and was unresponsive at some times and wrong at others; 3) as navigator, I miscalculated the scale of our map and got us lost so that we ended up spending the first hour of our journey literally going around in a circle; 4) there was a massive traffic jam on the A7 which led us to exit the highway and take a secondary road - a good idea. 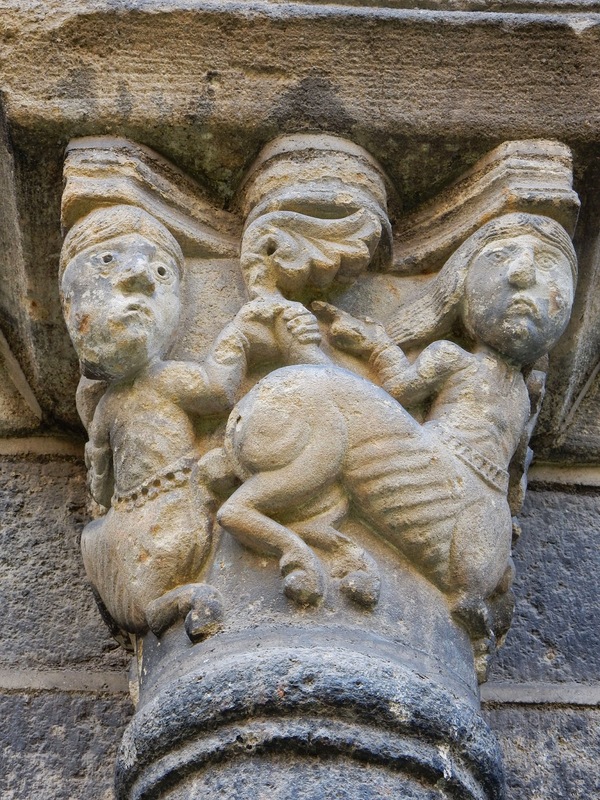 This capital at the top of a column in the cloister dates from the 1200s. 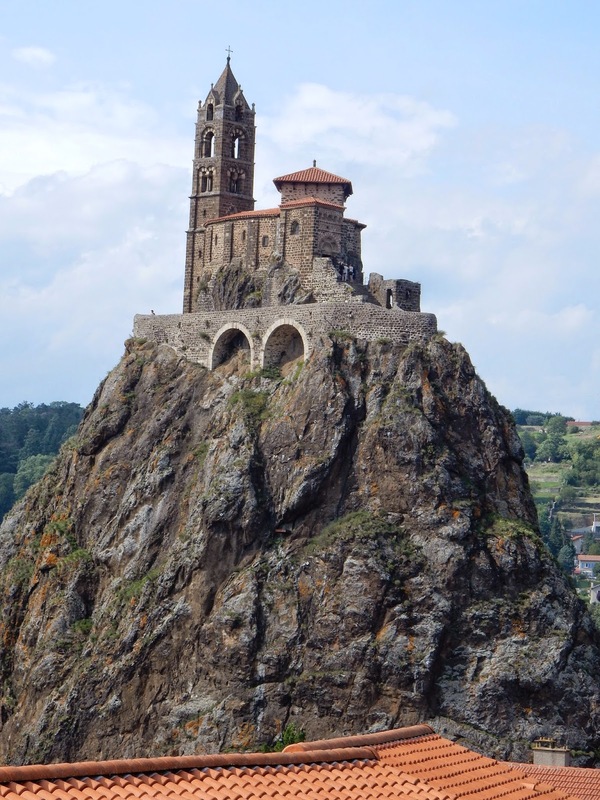 Because of these setbacks, we lost lots of time, but, fortunately, we made a stop at Puy-en-Velay in the Auvergne region. What a great place - and a complete revelation to me!! (Bob had done the research.) 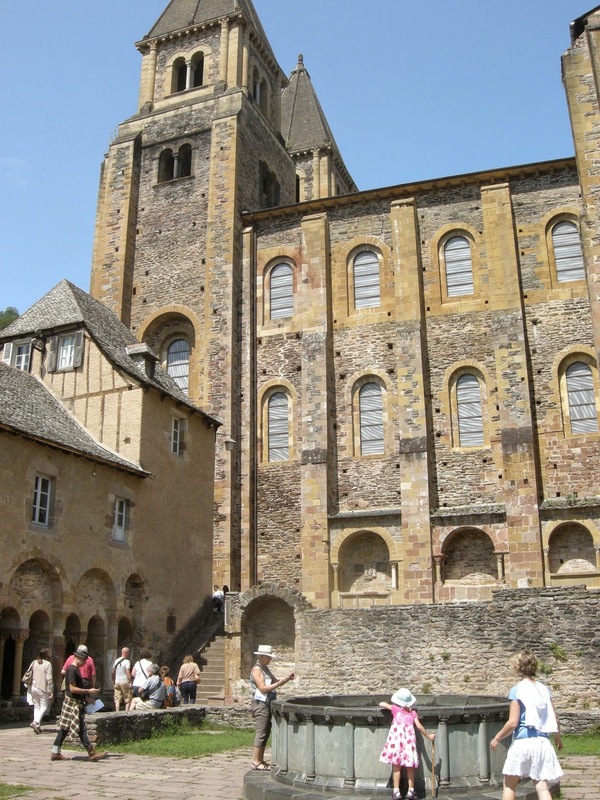 It has a long history, having been established as a bishopric over a thousand years ago. 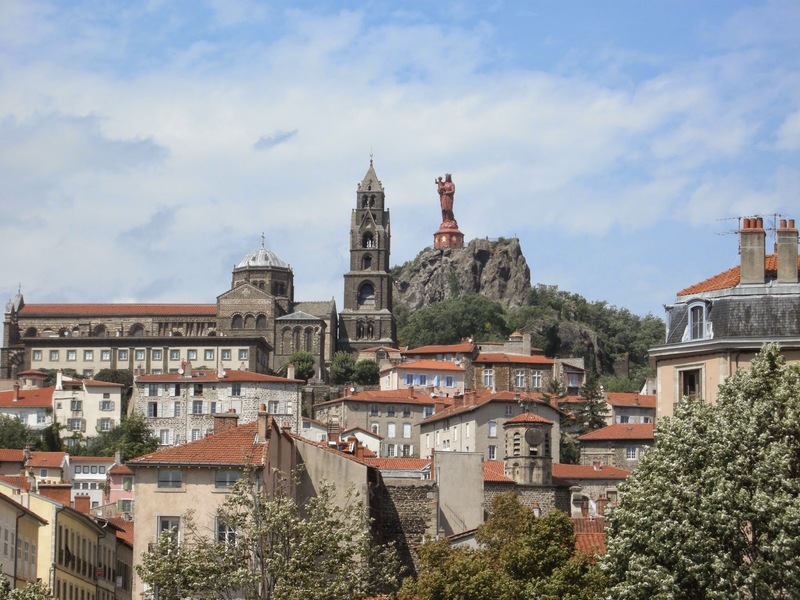 It is a stopping point on a French branch of the Camino to Santiago de Compostella and has attracted pilgrims for centuries to its cathedral and "hotel Dieu". As a side note, I was born in the Hotel Dieu in Cornwall and until this day, I had not realized the full meaning of the phrase. 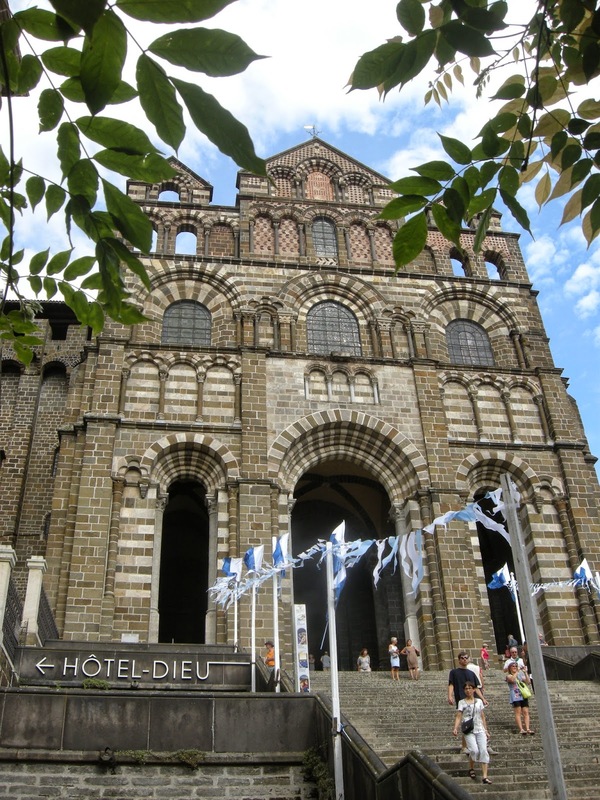 A Hotel Dieu was originally designed to provide shelter to weary pilgrims. Did you know that, brother and sisters? 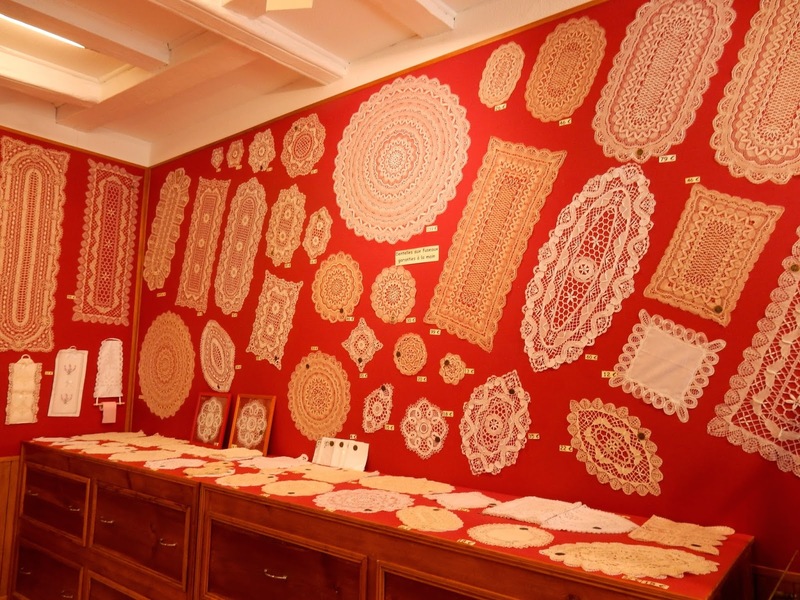 Puy-en-Velay is notable for its religious sites, but it is also a centre of the lace industry. 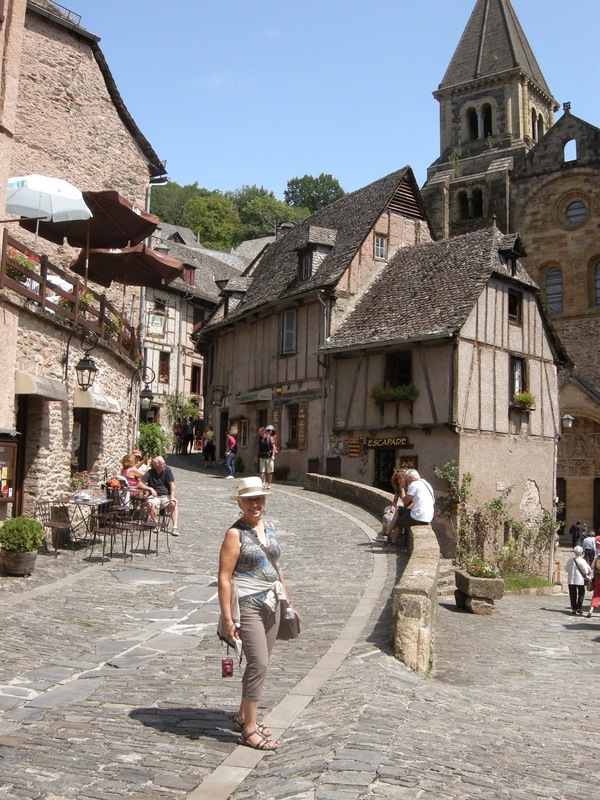 We found it to be a lively town with lots of cafés and shops; when we visited, there was also an extensive flea market. We would have liked to stay longer, but we had quite a lot of driving to do before we reached our hotel for the night in the Saint-Four area. It was a modest cottage for a good price, which we matched with a modest dinner at a local grill. Walking to the old part of town. 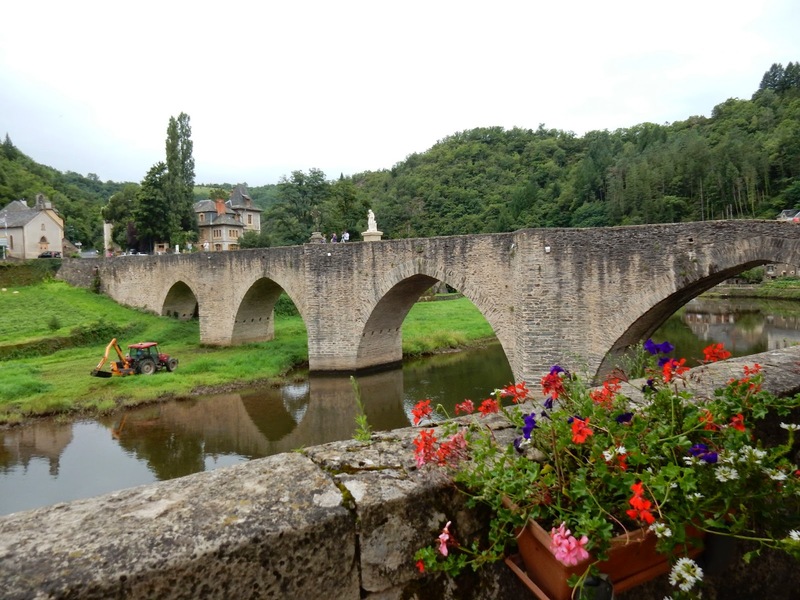 We made stops at two beautiful villages. 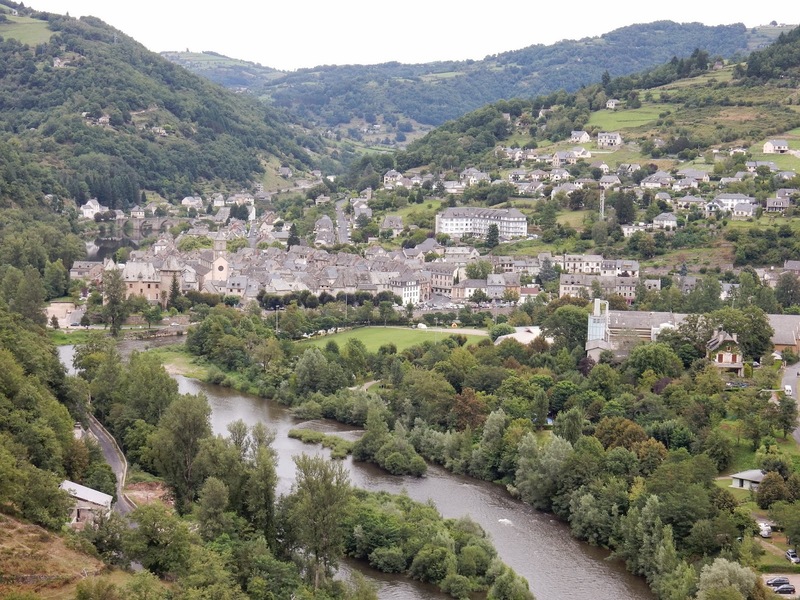 the first one, Estaing, was not a planned visit, but when we saw it from the road, we found a place to park and picked up a walking tour at Tourist Information. 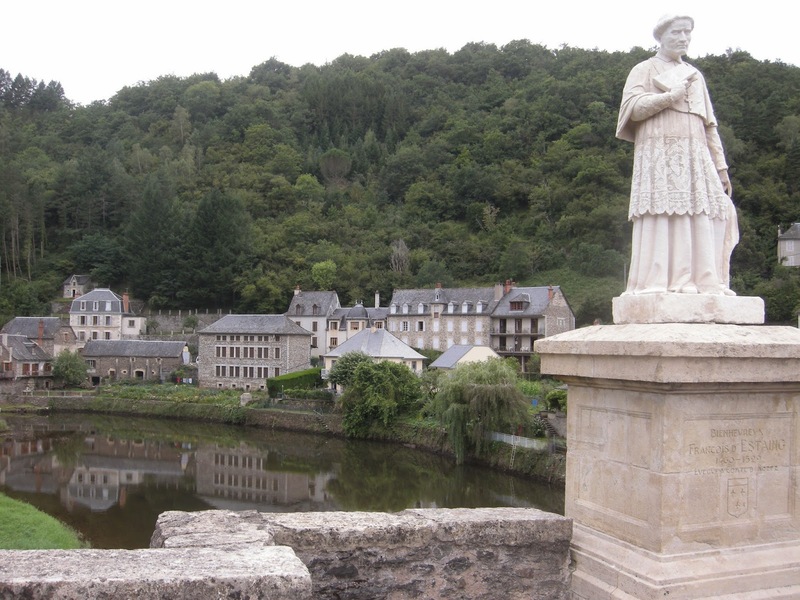 It has a castle, a medieval bridge and winding streets. Really pretty, even without blue skies. 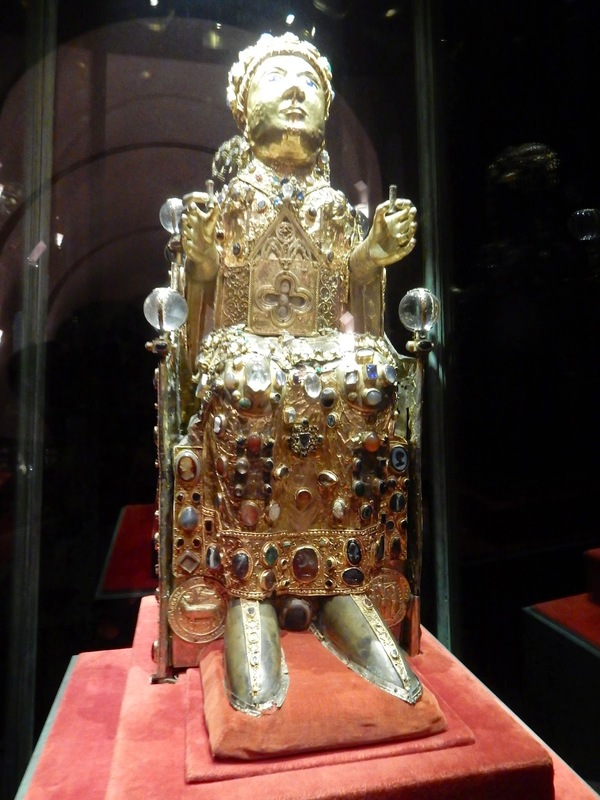 There is a remarkable collection of ecclesiastical art at Conques as well, the best for historical value that I have ever seen, since all the pieces were very old - from the 8th century to the 13th generally. Our journey today took us along the river Lot for much of the time, while at others, we were climbing or descending. 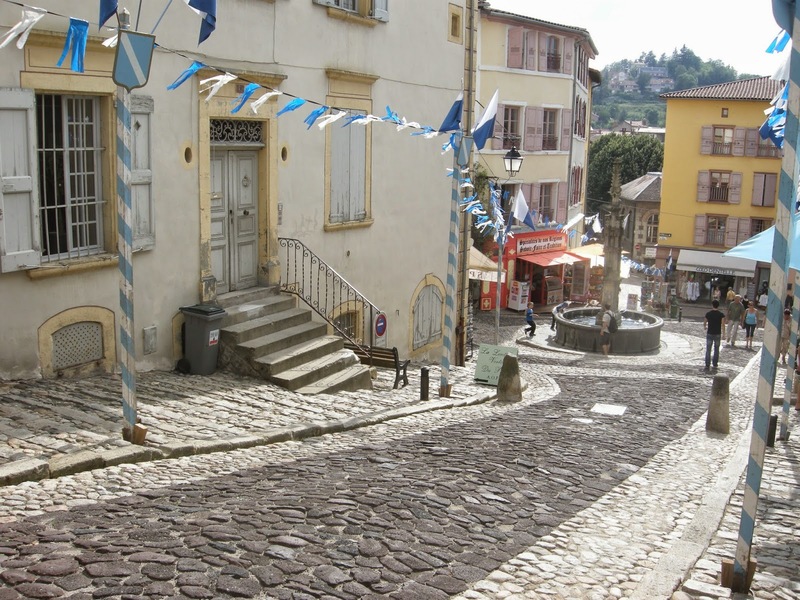 Eventually we arrived at our destination, Sarlat-le-Canéda, a return visit since we stayed in this area six years ago. For dinner, we had reserved at La Source in nearby Tursac. It was our favourite dining experience in 2008, so were keen to eat there again. We were not disappointed. Full, we returned to our hotel for the night.